The Rawlplug eye bolt is suitable for temporary and permanent anchorage. Supplied complete with shield, washer and hex nut. 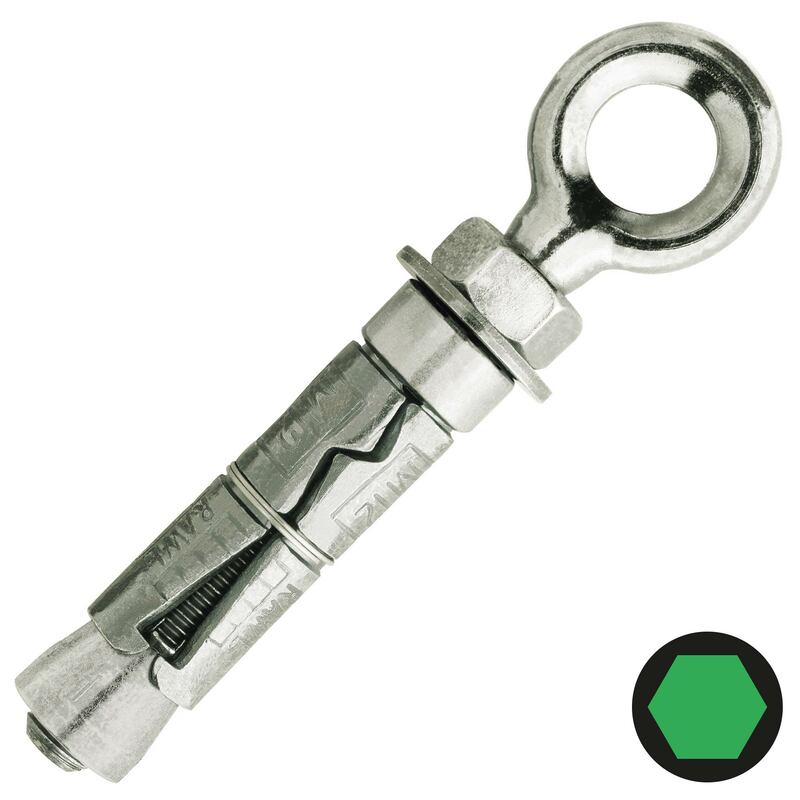 Must not be used for safety harness applications or for lifting where shock load could be applied. Typical applications include supporting guy ropes, stays, cables and supporting ladder restraints. How do I select my delivery service? During the checkout process, you will be shown a delivery calendar. This calendar will automatically select the next available 'standard' delivery date. You will have the option to choose a specific delivery date of your own choice (up to 7 days in advance) and have the options of the service upgrades available in your delivery area. What if I'm not in or I miss my delivery? Our courier will send out a text message or email on the morning of your delivery. From within this message you will have the choice of leaving your parcel in a safe place, leaving with a neighbour, requesting a 'drop to shop' (more info below), or re-arranging a more suitable day for delivery. If you know in advance that you're going to be unavailable, and If you'd like us to leave your delivery with a neighbour or in a secure place, just let us know when you place your order - you can tell us in the 'special instructions' box on the Delivery options page. If you ask for the item to be left in a safe place, on the day of delivery we'll drop a card through the door to let you know where we've left your parcel. If our driver cannot make contact with you we will attempt to deliver again the next working day. If this isn't convenient for you, just call the number on the card and we'll arrange an alternative delivery day. Once we have delivered your parcel we will automatically update your order status on your account. What is Drop To Shop? Can I track my delivery? Can my order be delivered to a site or an alternative address? Yes! You can add a new address, or edit your current delivery address during the checkout process. How do I get my 1 hour time slot? On the morning of your delivery, our courier, DPD, will send you a text message or an email with the time slot on it. Attached to this message they will give you alternative options if you know you are going to be unable to receive your parcel. Do you deliver outside of the UK? Not currently, no, we cannot offer delivery outside of the UK.